I knew that Ian would make a great father one day. We both talked about our love for children very early on in our relationship. Our desire to become parents and to build a family together helped solidify our union. In fact, I was attracted to Ian even more because of this. 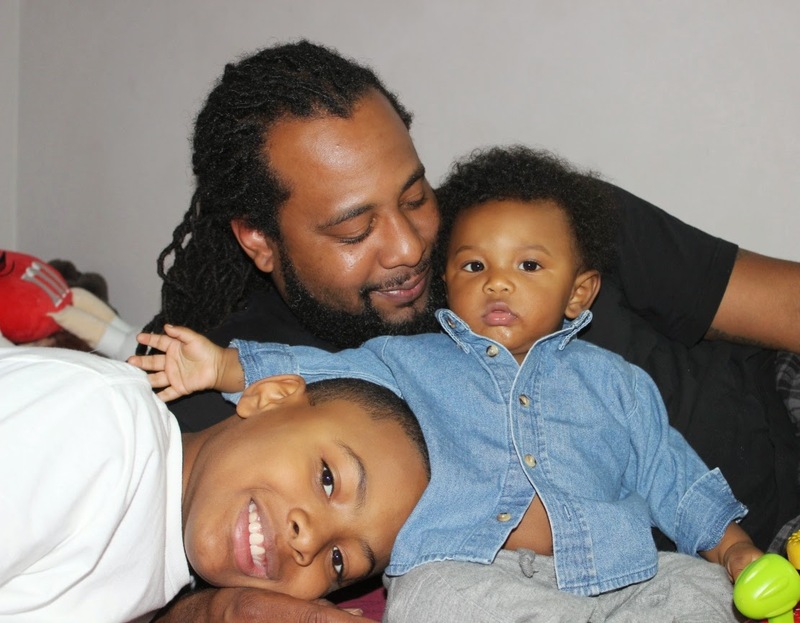 Now, two children later, he has proven that his role as a Dad has made him an All-Star in the eyes of his boys. Ian loves our boys. I know that seems so obvious, considering it's the simplest requirement of being a parent. But, his actions do speak on these words. He ends every night with, 'I love you', to the boys. He makes sure that no matter what, they hear these three words. For our oldest, it is usually accompanied with a playful head rub and for our youngest, a gentle kiss on the cheek. I always sit back and watch them in action. The way he moves so tenderly with them. He embraces the term "precious cargo" and makes sure that his boys are treated with genuine care. This makes my heart melt every time. Like, every time. It never gets old. I am more than certain that this love shared between a Dad and his child(ren) extends far beyond our household. I can imagine all the amazing men that are responsible for the immense amount of love that children feel on a daily basis, in some form. It is easy to overlook their efforts in the world of parenting because the world has dimmed a Dad's spotlight to showcase all aspects of motherhood. But, I have no problem shouting from the mountaintops about the admiration I have for Ian. He is a great Dad. 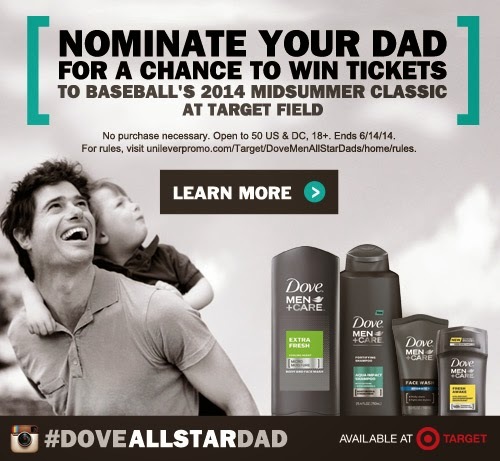 And Dove Men+Care and Target want to celebrate All-Star Dads like him! Show your Dad, husband or father figure how much you care and how he has impacted your life for a chance to win tickets to Baseball’s 2014 Midsummer Classic! Simply submit a quick video explaining why your All-Star Dad is the best with the hashtag, #DOVEALLSTARDAD. Videos submitted via Instagram can be a maximum length of 15 seconds, while videos submitted through the sweepstakes microsite can be a maximum length of 30 seconds. 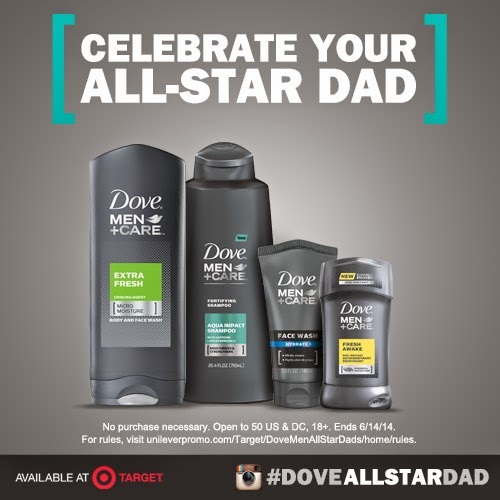 So choose Dove Men+Care for the All-Star Dad in your life and head over for your chance to submit your video from 4/13/2014–5/4/2014. While you're at it, check out some of the awesome products from the Dove Men+ Care line at Target stores. Leave your All-Star Dad feeling fresh and smelling good. Dove Men+Care Extra Fresh Body Wash 18oz: Dove Men+Care Extra Fresh Body and Face Wash with MICROMOISTURE technology is clinically proven to fight skin dryness better than regular men’s body wash. This ultra-light formula delivers extra refreshment with a cooling agent, then rinses off easily for total skin comfort. Dove Men+Care Extra Fresh 4-Bar: Dove Men+Care Extra Fresh Body and Face Bar with Dove ¼ moisturizing cream and an invigorating scent is clinically proven to fight skin dryness. It thoroughly cleanses and rinses off easily without leaving skin feeling dry and tight like regular soap does. For total skin comfort and extra refreshment. Dove Men+Care Fresh Awake Antiperspirant Deodorant 2.7oz: Dove Men+Care Fresh Awake deodorant is specifically designed to give men odor protection — without compromise. Jumpstart your day with its unique combination of one of the most effective ingredients for 48-hour protection against odor plus 1/4 moisturizer technology. Dove Men+Care Aqua Impact Shampoo+Conditioner 25.4oz: NEW Dove Men+Care Aqua Imact Fortifying Shampoo moisturizes and revitalizes hair. Dove Men+Care Hydrate+ Face Lotion 1.69oz: Dove Men+Care Hydrate + Face Lotion contains an advanced formula designed for men’s skin to lock in moisture without feeling greasy. Protect your face from sun damage with broad spectrum SPF 15 and helps to keep your skin looking healthy. Dove Men+Care Hydrate+ Face Wash 5oz: Dove Men+Care Hydrate + Face Wash features a mild formula that cleanses thoroughly and rinses easily while effectively fighting dry skin. Its lather activates on skin leaving your face moisturized. Dove Men+Care Hydrate+ Shave Gel 7oz: Dove Men+Care Hydrate + Shave Gel is specifically designed for men’s skin and provides a clean, close shave. Its creamy lather foams quickly and leaves skin feeling smooth after shaving.